With this interactive mapping tool, explore local assessments of where in Africa specific infectious diseases (Ebola virus disease, Marburg virus disease, Lassa fever, and Crimean-Congo hemorrhagic fever) have the greatest potential to emerge and subsequently spread. 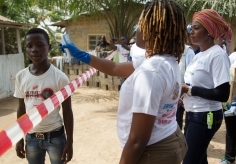 Examine national and subnational variation in where outbreaks could begin, spread locally, or progress into a widespread epidemic impacting communities across the region and internationally. Compare diseases’ pandemic potential assessments with recorded occurrences. View outputs and share map settings easily. 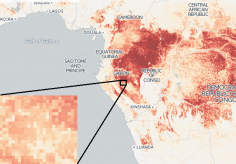 Please note that this tool builds upon and replaces the “Spatial epidemiology of Ebola virus disease” visualization. A new scientific study provides the first evidence-based assessment of pandemic potential in Africa prior to outbreaks and identifies ways to prevent them.